Appearance: Dark's maw, though refined, is sunken and scarred. 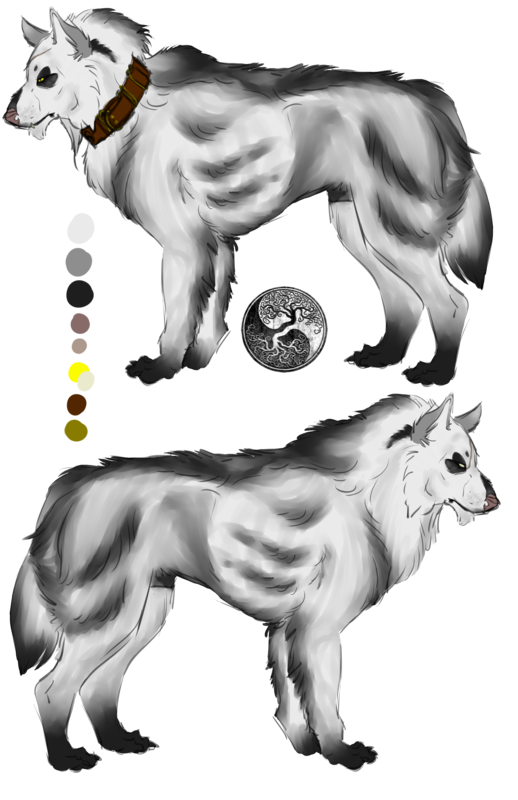 Dark markings hang below bright eyes, dark brow resides above. Ears are triangular, set on the sides of his skull and often alert. A previously injured pink nose is encompassed in ebony markings, reaching from the bend of a once broken snout and down to the bottom of his upper lip. Upon said lip lays a scar, marring the soft jowls and breaking the ashen color of his hide with the pale skin beneath. 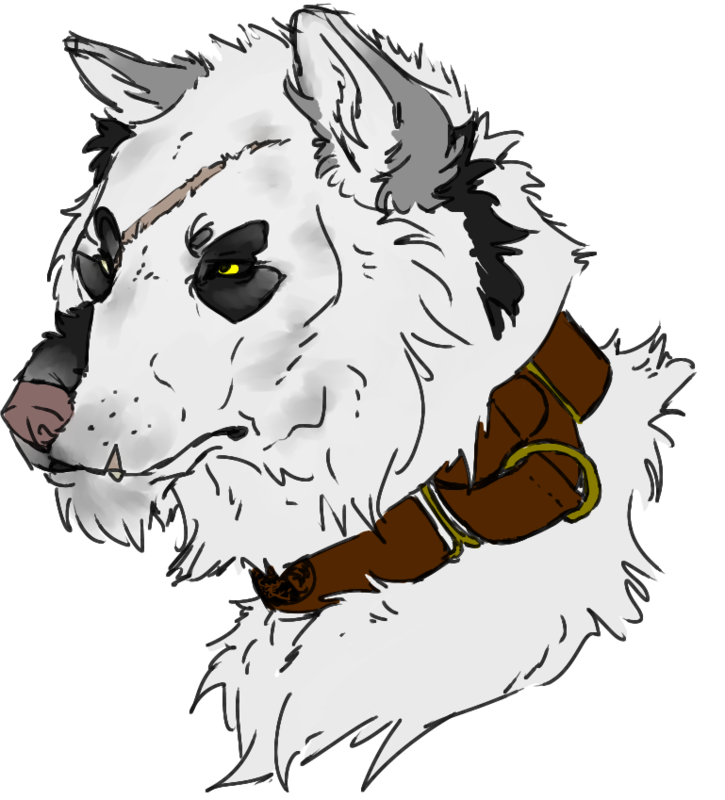 Not only does Dark look as if he might lead an abstemious life when it comes to the hunt, but he is also strapped in taught muscle and sinew. Broad shoulders carry thick arms, a barreled chest holds large lungs, and his legs are well endowed by many years of travel. A thick coat wraps his frame, from his mother's decent, as well as a thick mane that envelopes his face with silky fringe and heavy layers that cascade from his throat. Feathers reach back from his forearms and haunches, and his tail is thick and plumed. A dark primal stripe crawls through the hackles of his back, pooling above his shoulders before dropping down to the tip of his tail. All about his body, his guard hairs are frosted in black. He has grown well into his charcoal paws and grey ears, both seeming on the smaller side with consideration to his overall size. He's of substantial size, and certainly seems worthy of aggression. His defining features are one vanilla eye, milked over and without sight and a scar that reaches from the inner apex of his eye, to a point slightly below his left ear. His Lupus form is tall and slender, dense coat hiding the muscle beneath, though not dense enough to hide the irregular rise of his abdomen. His Secui form is taller, even so, and his musculature is more blatant. His build is altered from slender to strong. Heavy coating doubles, light and silky in most places, but stiff across his hackles and down his spine. Due to the change in density of his coat, a fringe falls above his forehead; lighter points become lighter, and darker points become darker. Dark is a quiet creature, not much one for prattle or hearsay. He hasn't had the makings of much social interaction, the cause for his issues with other homes in the past and, certainly, the reason why his ability to connect with others ranges from meager to absent. He has a strange way about him, an aura almost, of something not-quite right. It isn't awkwardness, lord knows he's very comfortable in his own skin, but it would lead one to think that he might have some malicious history beneath his belt. Whether this is true, or not, he isn't one to unveil his history to most. His secrecy is his shield against the common misunderstandings of those he deems fruitless, but to those who have managed to fight the battle of his apathetic and sometimes avoidant nature, it doesn't take much for him to tell someone what they'd want to know. A friend in Dark, is a friend, indeed. This in mind, he isn't awfully concerned with his own well-being, his malnourished frame is a good display of that, so brash decisions to defend those he has come to trust with his life aren't by any means uncommon. And though it is considered foul by most, if one has dared to make himself an enemy, albeit the opposing side of a warring nation or a comrade in arms that depreciated the value of what some would have once called friendship, he will personally wave a farewell and allow such individual to be bled dry. His moral values are not strongly weighed to the innocent, but the image of them and the idea that he isn't to be pestered, toyed with, or otherwise be given frivolity in his demands is what matters most to him. He is a hard working individual, finding solace in a days toils. He is also a beast who finds peace within music. A softer side of his rather harsh male resides within the confines of his heart. There is something within him reaching out, trying to claw it's way from beneath the apathy that takes over his daily life. A more serene version of himself seeks a reason to be, but without warrant, it shall remain hidden and considered a weakness in his logical mind. Biography: Detailed and expansive Biography is available on Dark's Character Wiki.